To most people, giving a wedding speech – or even the thought of giving one – is a terrifying thought. It’s not just about coming up with an appropriate presentation. It’s also about talking in front of hundreds of guests – many of whom are strangers. And for most people public speaking isn’t their strong point. In fact, many people go out of their way to avoid speaking in public. But eventually they will be asked to “say a few words” – especially at a friend’s wedding. Wouldn’t it be nice if you could stand up in front of hundreds of strangers and give an eloquent, funny, sentimental speech that has everyone laughing and applauding and even cheering after you’ve finished? Usually that skill takes some experience. But that doesn’t mean you can’t do an amazing job even if you’re not an experienced public speaker. Of all the suggestions I’ll be making, this is the most important because the best way to build confidence is to be prepared. The more prepared you are the more confident you’ll feel. That means you have to start well ahead of time. How you do that is quite simple. First you want to think about what you want to say. Think of quotes you might use. They could be quotes from famous people or sections of songs or even verses from a poem. Think of the theme you might use. Think of a story you could use. Think of a wedding joke or two that you could use. Think about ideas on how you can make your presentation entertaining to the guests. For example, it might be a tribute combined with a slide presentation. Or, if you’re a musician and singer, you could sing your speech the way Tom Fletcher of Mcfly did when he presented his groom speech. Think of how you want to end your presentation with your wedding toast. As you go along, make lots of notes and jot your ideas down – no matter how bizarre or strange they may seem at first. Success in speaking in front of the guests is knowing what you are going to say and saying it clearly and distinctly. If you’re at a loss for words or things to say then be sure to check out the speech samples affiliate link here. Now you come to organizing all of your notes to see how to put your presentation together. If you still don’t have any ideas or you are at a loss for words, get wedding speech samples. They make the process a lot quicker and easier. If you’re starting from scratch without wedding speech samples then start writing your presentation. This is your first draft so it doesn’t matter if things are out of order or the wording isn’t quite right. But just start jotting down ideas and expanding on them. Try and get your ideas to flow together. Once you have a rough draft start going sentence by sentence and changing words. Add words. Delete words or sentences. Make sure your grammar and pronunciation are correct. Don’t use words people don’t understand. Keep it simple and pretend you’re talking to a friend. Wedding jokes are always a welcome addition to a speech. But they must be treated with caution. Off color or inappropriate jokes will ruin your tribute and be an embarrassment. Where people make mistakes with wedding jokes is thinking that their joke is funny when it’s not. That’s why it’s always a good idea to used tried and tested jokes and to see whether they fit in with your presentation. Your jokes can be almost anywhere in your tribute – except at the end which is reserved for your toast. You can start your presentation with a joke or you can include jokes throughout your presentation – there is no hard and fast rule except that any jokes you use should be appropriate. If humor isn’t your style, don’t include it. This is one of the hardest parts of writing. Now you have to either trim or add to your tribute. Take it section by section. Read it out loud to see if it flows smoothly. Ask for advice from friends or family members. If it’s not what you really meant to say, rewrite the section. Once you have a more or less complete draft it’s time to see if it’s too long. Most tributes at a reception shouldn’t run more than 5 minutes – maximum. In fact, if the speeches and toasts event is dragging on, the shorter your presentation is the more it will be appreciated. But don’t leave things out just to make it short. Stick with your main theme or idea – just don’t drag it out or belabor the point. Once you’re satisfied that what you’ve written can’t be improved, it’s time to practice. You can choose to practice in a couple of ways. 1. You can memorize most of your speech word for word. 2. You can memorize the key points of it and fill in parts as you go along. If you memorize everything word for word and then forget something you could falter and be in trouble. On the other hand, if you memorize only key points you may forget things that you wanted to include. The best advice I can give is to practice until you feel comfortable presenting it. If that means memorizing it virtually word-for-word then that’s fine. If you feel comfortable reading from notes (not reading it word for word) then you might not need to memorize everything. Your notes are your triggers to jog your memory of what you want to say. Whichever method you choose, make sure your presentation sounds natural and unrehearsed. And avoid at all costs reading your speech and toast. Now that you have your speech prepared the day will arrive when you have to present it in front of the guests. First, make sure you have your notes with you. Even if you have your notes on your phone, it’s wise to have them printed out and in your jacket pocket. You should feel confident that you’re well prepared. Before you’re introduced by the Wedding MC take some slow, deep breaths. Make sure you’re relatively close to where you will speak. You want to be able to get to the microphone quickly rather than walking across the room. Get yourself grounded. Take your notes out if you have to. Thank the Master of Ceremonies then address the guests. Depending on the circumstances you might move around a little – especially if you’re going to be near the bride and groom. If there’s a microphone, it does help to know how to use if beforehand. If possible, check with the MC before the reception starts and find out where you will speak. Keep the microphone about 12 inches from your mouth. There’s no need to speak loudly since your voice will be amplified. If there’s no microphone then you’ll have to speak loudly. Be prepared for noise while you speak – it could be the venue or catering staff as they clear dishes or prepare a serving or it could be other guests who are not paying attention. Pause if you have to. If guests laugh at a joke, don’t cut them off. Enjoy the laughter since they laughed at one of your jokes. If you’re nervous to begin with, that’s fine. Even experienced speakers and comedians are nervous before they begin. In fact, being nervous can help your presentation. It doesn’t necessarily mean you’re scared to death. It also means you’re excited to make a speech and pay tribute to the bride and groom. Remember, don’t apologize for your nervousness. Hide it as best as you can and continue. Usually, people find that their nervousness lessens a short while after they begin talking. 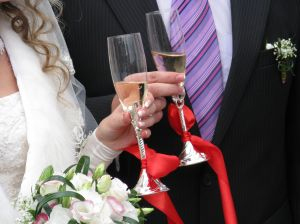 Ask the guests to stand or to raise their glasses and toast the newlyweds. One of the best ways to feel even more confident preparing your tribute is with professionally written speech samples. Sometimes the right words just don’t come to mind. You don’t know how to express your sentiments. Or you’d like to add some wedding jokes but you don’t know any. That’s when you turn to all ready prepared samples – templates with wording to use, one liners, wedding jokes, and more to make it quick and easy for you. Of all the people who attend the reception, the Mother of the Bride is one of the proudest. After all, her beautiful daughter is about to be married. 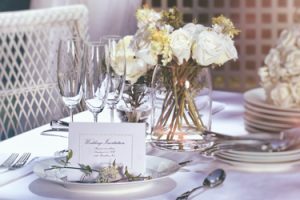 It’s rare when the Bride’s mother isn’t involved with the wedding planning – from the initial stages all the way to welcoming guests at the reception. When time is at a premium, samples of other tributes is the fastest way to write a funny and sentimental speech that honors your daughter. If you’re like most people, the flush of pleasure at being asked to give a wedding speech at a reception quickly turns to a gnawing fear in the pit of your stomach as reality sinks in and you consider that you’ll have to stand in front of hundreds of guests as you pay tribute to the Bride and Groom. But it’s not just the fear of speaking in public that makes you apprehensive. It’s also the thought of coming up with something that is memorable and that doesn’t leave you feeling humiliated in front of strangers. You’d like your speech to be funny. And you’d like it to convey your feelings for the Bride and Groom. Chances are you’re in a quandary because even though you have a vague idea about how to approach your speech, you don’t really know what words to use. And you very likely don’t have wedding jokes that will fit with your tribute. Of course, you also have to end with an uplifting toast. Are You Nervous – Even Terrified – About Giving A Wedding Speech? If you’re like most people, the thought of speaking in public is nothing short of terrifying. You’re not sure whether you’re up to the task. And you don’t want to be embarrassed – even humiliated – with a terrible speech. That’s where Wedding Speech Samples are worth their weight in gold – without paying a king’s ransom. They’re templates you use to create your own presentation from. >> You’ll see how to begin. >> You’ll see what wedding jokes to use. >> You’ll have samples of toasts to end your tribute with. But, best of all, you’ll be able to choose the words that convey your feelings. Or convey humor without embarrassing the guests or the newlyweds. Even after giving it some thought for a while, you still don’t know where to begin. Now…you could hire someone to do the work for you. And you’d pay at least $100. Usually a lot more than $100. What’s more, you’ll still have to do a lot of the work. You’ll have to provide information and come up with anecdotes so someone can craft your presentation. Instead, you can do it yourself – for a lot less. That’s when you need an outline – your “blueprint” that guides you along. You’ll see how much easier it is to say the words you want to when you have samples in front of you. While the wedding speech samples that are recommended on this site cover most of the speeches at a reception, you won’t find one of the most important tributes – and that’s the Father of the Groom Speech. And rather than adapt another template – such as the Father of the Bride’s tribute – to your Father of Groom Speech, I thought you’d rather find a set of examples that are specifically written just for you as Father of the Groom. Most people don’t realize just how critical the Wedding MC is to the success of the reception. I cannot emphasize enough how important it is for you to be prepared and organized if you’re to MC a wedding. The bride and groom and their families have invested hundreds of hours – and thousands of dollars – to make this celebration a huge event for their guests. The last thing they expect – or want – is to have everything ruined for them on one of the most important days of their life. And that can happen if you’re not properly prepared…and ready for virtually any contingency. > Guests can become bored and leave early if they’re not having fun. > The main meal can turn into a big disappointment if it’s served late or some of the guests don’t get served at all. > The garter toss and the bouquet toss can become shoving matches as guests scramble for the garter or the bouquet. > The wedding cake can topple off the table and end up in shambles on the floor as the newlyweds cut the cake. Of course, contingencies are only one part of your job. There are many more duties you’re responsible for – from creating an agenda to checking the reception venue to introducing speakers to organizing fun activities…as you conduct the events at the reception. 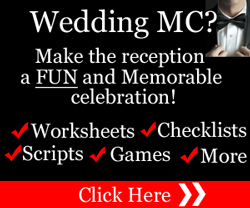 Use your Wedding MC Checklists and Preparation Sheets (found in How To Be A FUN Wedding MC). They’re your “lifeline” for ensuring things will run smoothly during the reception. Maintain a professional, courteous, enthusiastic – and FUN – demeanor throughout the reception. Start preparing for the reception early – at least a few weeks before the reception. Otherwise you’ll feel rushed and unprepared. The more prepared you are the more confident you’ll feel and the more smoothly the reception will run. Know what to say at the appropriate time throughout the wedding reception agenda. Get a feel for the flow of your scripts so they sound natural. Even though the guests will pay attention to you when you’re speaking, make sure the focus is on the newlyweds. Do not, under any circumstances, make jokes or comments that embarrass the bride or groom. The groom will be the “target” for good natured fun but there are limits to what should be said. Stay away from mentioning old girl friends, a previous marriage, poor track record with relationships, indiscretions, or a divorce. And don’t force the bride and groom to do something they don’t want to do – especially public speaking or something they feel makes them look stupid and would humiliate them. Take the time to find out how to pronounce people’s names correctly. Spell the name out phonetically (the way it sounds, not the way it’s written) on your checklists, notes, and/or run sheet, if necessary. The worst thing that can happen at a reception is for the guests to get bored and start leaving early. You want to make the reception a celebration. So ensure you have material on hand that creates a fun and party atmosphere. Things can – and sometimes will – go wrong at the last minute. Give yourself plenty of time to make any necessary adjustments before the guests start arriving. Be at the reception venue at least ninety minutes (if possible) before the reception begins to do a final check of everything. You won’t be able to carry out your Wedding MC Duties as a professional if you’re “buzzed” or drunk. So keep a clear head and go sparingly on the alcohol throughout the reception. Remember: You don’t want to be known as the Wedding MC who ruined the bride and groom’s big day. Find out from the Photographer and Videographer whether they need any areas of the reception room specifically cordoned off so they can get the “shots” they need. Your reception agenda is your guide and timeline during the reception so things move smoothly throughout the allotted time. Follow your agenda/run sheet (and estimated time frames) to ensure events don’t move too quickly or too slowly. Be mindful of the guests and give advance notice of upcoming events so they can refill their glasses, go to the bar, or use the washroom/restroom facilities. 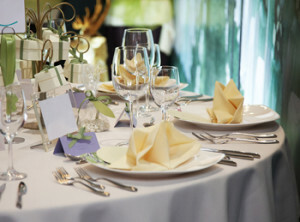 Make sure the bride and groom are served first and ensure they are enjoying the reception. Ensure that any special requirements they may have are attended to. And ensure they have safe transportation to their destination after the reception. From entertainment to speeches to announcements to comments – always make sure everything you say is in good taste and appropriate and won’t embarrass or humiliate anyone – especially the bride and groom. Instead of calling them the “bride and groom” or the “newlyweds” use the bride and groom’s first names as much as possible. After all, the guests know the bride and groom by their first names. Many first time or novice Wedding MC’s who I’ve surveyed in the past don’t know what to do or say at the reception. And for good reason – being the MC at a wedding is a huge responsibility. And if you don’t know what you’re doing, it can cause a lot of unnecessary stress and anxiety. Fortunately there is help…and it can save you countless hours of worry and frustration. >> MC Scripts. Know what to say for important events. >> Sample agendas or run sheets to use as your model. >> How to create a timeline for the reception so events start and end on time. 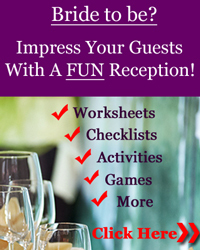 >> Fun entertainment ideas to keep the guests entertained and having fun. >> How to “kick up” your introductions of speakers for wedding toasts and speeches to make things fun. >> Checklists and preparation forms so you don’t miss the important things that are meaningful to the newlyweds (and there are a LOT of things you need to be aware of). >> Essential items to take with you to the reception. From clothing to supplies to props, this is an itemized checklist so you don’t forget to take anything important with you. >> The reception venue checklist on the wedding day. This is your final checklist before the festivities get under way so you’re not scrambling around organizing things at the last minute as the guests arrive. >> And much more…plus 5 valuable bonuses including your indispensable activity guide, The Wedding MC’s Secret List of FUN Ideas – with over 50 fun ideas for guest activities. 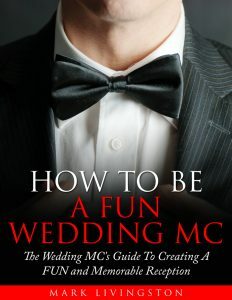 It’s all in How To Be A FUN Wedding MC – the popular Guide used by hundreds of MC’s all over the world. And it will save you innumerable hours of frustration trying to prepare for the reception. Click The Following Link For How To Be A FUN Wedding MC And Save Yourself Many Hours Of Frustration And Stress! It doesn’t matter whether you’re the Groom, Father of the Groom, Bride, or a member of the Bridal Party one fact remains – you’ll feel the pressure to deliver a speech that is both funny and poignant. If you’re like most people who are called upon to make a wedding speech, you’ll be flattered to be honored with the task. But as you think about what you’re going to say and try to put those thoughts into words, you’ll find it’s much harder than you originally thought. 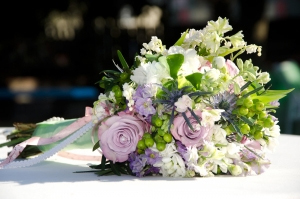 How do you express your heartfelt sentiments about the bride or groom? How do you add humor to your presentation that’s tasteful and funny – that gets a laugh from the guests and the newlyweds without offending or embarrassing anyone – including you. Those are questions that run through everyone’s mind as they begin to create their wedding speech. If the very thought of writing a tribute to the Bride and Groom seems overwhelming then you’re definitely not alone. It’s a common feeling for those chosen for this important task. Some people fall into the trap of thinking that it’s easier to “ad lib” their presentation. They think they’ll say just a few “off the cuff” words and finish with a toast and it will be sufficient. It’s a huge mistake to do that. In fact, you could find it to be humiliating as you stumble with your words in front of hundreds of people. You’ll be distracted with the noise of people talking as you speak. And if you’ve had a few drinks to bolster your courage you’ll only make matters worse. Most people are not comfortable with public speaking to begin with. The added pressure of a formal event such as a reception can get the better of their nerves when the crucial time comes to deliver their speech. It’s an honor to be asked to give a speech. And it deserves more than a few minutes scratching some words out on a piece of paper. Wedding Speech Templates are designed to guide you through the speech writing process by giving you professional examples. Of course, what the Father of the Groom says in his tribute will be entirely different from what the Mother of the Bride says. And the Groom’s speech is a completely different format from that of the Father of the Bride. And that’s what you’d expect – the Best Man is going to tell different anecdotes and have different memories than the Mother of the Bride. The sentiments will be different. The Mother of the Bride remembers the Bride as a young girl who has blossomed into a beautiful woman. The words the Best Man uses will very likely be different from those used by the Mother of the Bride. That’s why templates are so useful – there are different examples for many of the people who will be called upon to address the guests. 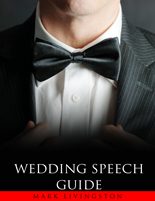 WeddingSpeech4U, for example, is a highly regarded speech template service which provides outlines for many of the speakers at a reception. Its focus is on providing well-written, professionally worded examples for the type of speech you’ll be writing. It will help you choose the BEST words….the RIGHT words that express your sentiments. It will also give you wedding jokes and one-liners. You’ll be able to see almost at a glance what wedding jokes are appropriate. And you might choose to use a one-liner to begin your presentation. 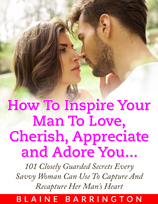 Best of all, it’s like being guided step-by-step through the speech writing process – all the way from the opening line to the finishing toast to the Bride and Groom. If you had someone create a speech (and toast) from scratch you’d very likely pay $100 or more. Some speech writers charge even more. And you have to give them the material to work with. With speech samples you can mix your own material in with proven material that has been written by professional writers. Best of all, you can mix and match. Or combine humor and sentiment in your tribute. Cut and paste parts of different speeches to create your own unique presentation and tribute. When you use Wedding Speech Samples you craft a memorable speech using proven words that evoke humor and emotions. You’ll find the task much faster and easier than starting from scratch and trying to find the right words that will have so much meaning to the newlyweds. …you’ll feel much more confident when you stand in front of hundreds of guests to deliver your tribute. It’s not unusual for there to be an MC at a wedding reception. The Master of Ceremonies can also be the Best Man although a separate MC is quite common. Usually, a reception won’t have an MC if it’s a short one or there are not very many events planned. For example, if the reception is an intimate one with a small number of close friends and family or has only a few events because it’s a short reception, then it’s unlikely that an MC would be required. If you’re the Bride and Groom, there’s no need to agonize over whether to choose a personal or professional Master of Ceremonies. It really comes down to your budget and the person you choose as MC. If you have a huge budget or the reception is elegant with many dignitaries, a professional MC might be the wisest choice. In this case, a professional will normally have more experience in hosting small and large receptions. And an MC who has extensive experience will be well versed in organizing the events and following the agenda to ensure everything runs smoothly and on time. He or she will know how to warm up the audience, have a repertoire of wedding jokes, know how to introduce speakers, and will display a high level of confidence. 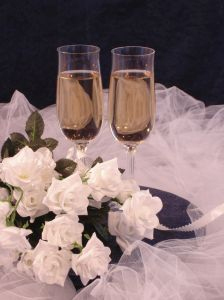 If the reception has many dignitaries, then the Wedding Speeches and Toasts will be a major event. And it’s critical that introductions be made properly and that the event doesn’t become boring. Many Brides and Grooms choose a novice MC to conduct their reception. 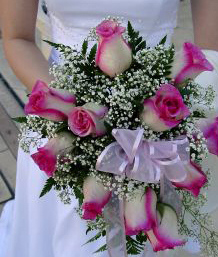 First, it’s a way of honoring someone close to the Bride and Groom. In most cases, the MC knows the Bride and Groom or their families personally. So it feels more intimate to have someone the newlyweds know conduct their reception. As well, in many cases the wedding budget doesn’t allow for an expenditure of hundreds or thousands of dollars for hiring a professional. As I said, the novice MC is usually a close friend or family member. It might be the Best Man. It might be the Father of the Groom. The advantage of having a close friend or family member as MC is that they’ll want to do an outstanding job to make your wedding a memorable celebration. What’s more, they may know many of the people who will be giving wedding speeches and toasts. That makes it far easier to prepare introductions for the speakers and help them prepare their tributes. There are certain qualities that an MC should have. They are particularly important at a reception where there is an agenda and timeline to follow. 1. Extroverted personality – You need someone who is outgoing. A mixer. Someone who isn’t afraid to meet new people and talk to them. 2. Well organized – You need someone who can multi-task and who doesn’t freak out when having to keep an eye on several things at once. 3. Gracious demeanor – You need someone who is courteous and kind and treats everyone equally and is sensitive to traditions. 4. Well spoken and articulate – You need someone who has command of the Queen’s English and is clear and can be understood. 5. Fun to be around – What a joy to be around someone who is fun, someone who makes you feel good and makes you laugh. 6. Confident – Your MC should be composed and self-assured, secure in the knowledge that what he or she does is the right thing to do. 7. Enthusiastic – Everyone loves enthusiasm and a person who is eager to enjoy things. 8. Reliable – You must be able to sit back and know that things will be done the right way and on time. Choosing a novice MC means they probably won’t be familiar with the duties and responsibilities of the Wedding MC. He or she will need to prepare MC Scripts…prepare an agenda or run sheet…make MC Speeches…introduce the Bridal party…introduce the Bride and Groom as they make their Grand Entrance…make Wedding MC jokes…co-ordinate the entertainment…and create a fun time for the guests and the newlyweds. And not one to be taken lightly – by the newlyweds or the MC. When you consider that the average wedding cost is over $25,000 in the U.S. and up to one-half of that amount can be spent on the reception, it’s important that you choose an MC who will do a good job. But it’s more than doing a good job. It’s also about making it a fun time for everyone. The reception is what many guests will remember about the wedding. So you want to ensure that things go smoothly. And you want to create a fun experience for them. If you’re the Bride and Groom, you shouldn’t just hand the reins over to someone and trust that they’ll know what to do. Instead, it’s much wiser if you can help your MC get up to speed with their duties. 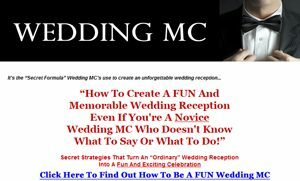 And there’s only ONE guide, in my opinion, that’s comprehensive enough to do that – one that takes a novice Wedding MC practically by the hand and shows him or her how to prepare a FUN and Memorable reception. 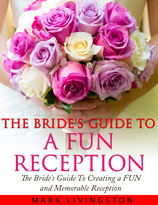 The Bride’s Guide To A FUN Reception is filled with checklists, preparation sheets, forms, and tips – all designed to make the reception run smoothly while everyone is having the time of their life. You can save hundreds – even thousands – of dollars by selecting your own Wedding MC. And you can rest easy that your reception will be in good hands knowing your MC is following a Comprehensive Guide – your guide – that turns your reception into a FUN time as you celebrate one of the most important days of your life.